This site is remaining online as a historical resource, but is no longer active. For questions or to report potential violations of the Quiet Zone, please use the e-mail to the right. Thank you for your support! The Winter Street Quiet Zone is now in effect in earnest. There was reportedly an issue with the directive from the railroads not going out in a timely manner, which has since been rectified, as well as discrepanices in signage as mentioned previously. Remember, even if the trains are in a Quiet Zone, the train horns are REQUIRED to sound if there is anything or anyone on the tracks, so we are bound to hear horns sporadically. If you hear horns consistently, there is a way to report those potential violations (we say potential because there may be a good reason for the horn). That information is at the top right of this page. With that said it looks like the WashingtonQuietZone.com team is done. We'd like to thank you all again for your support and input through this long process, and we wish you the best, quietest sleep possible. If you have any questions, please don't hesitate to let us know at the e-mail address above! The Winter Street Quiet Zone, which was due to go into effect yesterday, the 27th of September, does not appear to be in effect after all. Many people have reported that every train that comes through is still sounding its horn at all crossings. Our own investigation into this matter has shown that there is no Quiet Zone signage posted for the engineers on the rail line itself. In areas of the Washington Quiet Zone that are already implemented, signage similar to the one at the Heights crossing, shown below, is displayed. There is no such signage in the Winter Street Zone. We have been in touch with the city on this issue and they are working with UPRR to determine what the problem is and how soon it will be fixed. Even though the city is working on this, in order to keep pressure on this issue to get it fixed, please do not refrain from reporting violations of the Winter Street Zone. The more voices they hear, the more quickly this will be rectified. As always, your neighbors thank you for your support! WINTER STREET QUIET ZONE APPROVED! The Quiet Zone has been approved by the railroad and the Federal Railroad Administration, and construction is complete for the Winter Street line! All signage has been placed, final paperwork has has been signed by Mayor Parker and it has been filed with UPRR and the FRA. We are in a 21-day waiting period that ends on September 27, at which time the Quiet Zone will be in effect. As of September 27, the directive for the Quiet Zone will be given to the engineers. As with any big change, there will be a period where they are learning to not sound the horns at the crossings. This should be EXPECTED. As per the process of the Sherwin to National zone, I plan to give them a couple of weeks to comply before alerting the railroad of non-compliance. How you decide to respond is, of course, up to you. Remember, even if the trains are in a Quiet Zone, the train horns are REQUIRED to sound if there is anything or anyone on the tracks, so we are bound to hear horns sporadically. BUT, if you hear horns consistently, there is a way to report those potential violations (We say potential because there may be a good reason for the horn). For complaints, send an e-mail to Jack.Hanagriff@houstontx.gov . The more detailed information you can give him the better. At this time, the southernmost track that runs through the First Ward is not included in the Quiet Zone, so there will continue to be train horns in the area as a result of that track. We are going to look into the possibility of adding that track to the Quiet Zone, but due to the budget crisis at the City, that process could take several years. The good news is that the southern track carries on average about 25% of the traffic of the Winter Street track, so train horns overall should diminish significantly. It has been more than five months since our last update, and we have been receiving an increased amount of inquiries on the status of the Winter Street Quiet Zone. We have a bit of news to report, but nothing concerning timing of the final decision from the Federal Railroad Administration (FRA). As of Tuesday (May 10), the latest report is that the FRA is "finalizing their documents" to let us know about approval. Based on the length of time this has taken as well as offline discussions with officials, there will probably be more construction that will have to be completed before the Winter Street Quiet Zone can be put into effect. Until we know what this potential construction might be, there's no way to guess on a timeline. We wish there were more news to report, but that is what we have for the time being. Once the ball is put back into the City's court, we will let you all know. We have received some updated information from the City on implementation of the Winter Street/First Ward area of the Washington Quiet Zone. First off, there is one clarification that we had not been able to get an answer on in the past. Unfortunately we have learned that the Quiet Zone will only apply to the Winter Street track. The other track is not covered by the Quiet Zone. We are working on some clarification of this issue. The city has to send in an application for Federal Railroad Administration (FRA) approval. The city is required to send in traffic counts along with this application, however the counters were vandalized, making the data incomplete - therefore they had to begin their traffic study again. They are hopeful that they were able to get good data from the replacement set of counters. Once FRA receives the completed application and required information, they will make the final decision as to establishment of the Winter Street Zone. Applications to the FRA that ask for exceptions (and we have a big one since Winter Street track runs down the middle of the street) do not have set comment period times. Once the FRA receives the application, we will have to wait on their decision. We were hoping for more definitive news, but this is where we stand at this point. We all wish it were better news. We’ll keep you updated as things progress, and continue to update you when we have news. As mentioned before, we will be here advocating for the full length of the Washington Quiet Zone to go into effect until it is completed. We have received updated information on the timeline for the Winter Street/First Ward Quiet Zone. The Safety Zone portion of the work has been completed and that project is closed out, so the Notice of Intent for the Quiet Zone was filed as of August 4, 2010. We are now in the 60-day comment period for the stakeholders (all operating railroads, FRA, TXDOT and HPD) that will end October 4. A diagnostic team meeting is scheduled for the week of October 11th, where the railroads will comment on the Quiet Zone plans and request adjustments and/or additions to the city's plans. Once this meeting happens, we will know more about the timeline and whether there will be additional comment periods or not. This means that the Winter Street/First Ward Quiet Zone will not be implemented by the end of October as originally thought. Once we hear from our contacts about how the meeting goes on the week of the 11th, we will post another update. Not the best news, but at least the process is moving forward. The Quiet Zone from Sherwin to National has made a huge difference in the lives of residents. The team has heard from many of you saying that you did not realize how much the horns were affecting you until they stopped. This "quieter zone" has benefitted the community and truly increased the quality of life in the area. With that said, we do hear train horns every now and then in the Quiet Zone. Remember, the train horns are REQUIRED to sound if there is anything or anyone on the tracks, so we are bound to hear horns sporadically. BUT, if you hear horns consistently, there is a way to report those potential violations (We say potential because there may be a good reason for the horn). For complaints, send an e-mail Jack.Hanagriff@houstontx.gov . The more detailed information you can give him the better. We've added this information in the sidebar so it will stay visible. We have just received word about a press conference to be held with City officials celebrating the Quiet Zone's implementation from Sherwin to National. When: THURSDAY, May 27, 2010 at 10:30 a.m.
Background: The City of Houston is proud to announce the completion of the Washington Quiet Zone from Sherwin to National. If you can attend, please come and show your support for the officials whose hard work and dedication made our Quiet Zone possible! Anyone been sleeping a little better lately on the west end of the Washington Quiet Zone area? On May 13 the Washington Quiet Zone from Sherwin to National officially went into effect. While there have been sporadic horns heard, we are still in the adjustment period where the train operators are getting used to not blowing their horns through the corridor. We are working with the city and UPRR for a system of notification when the train horns are blown unnecessarily. We expect to have instructions in place for anyone who wants to report a train horn by May 27, which is the end of the adjustment period. We have just received updates on the Washington Quiet Zone from the City of Houston's Public Works and Engineering department. The Quiet Zone construction is complete from Sherwin to National. All signage has been placed, Thompson and Bonner Street crossings have been closed, final paperwork has has been signed by Mayor Parker and it has been filed. We are in a 21-day waiting period that ends on May 13, at which time the Quiet Zone from Sherwin to National will be in effect. While this is great news, There is still a possibility of delay, however any delays would be due to objection from the Federal Railroad Administration or Union Pacific. Delays are not expected, as the plans were previously approved by those entities. With regard to the delay mentioned in the last post for the Cottage Grove area at the Sherwin crossing, that situation was rectified at the last public meeitng, when Tom Dornbusch, Vice President of Super Neighborhood 22, suggested a workaround, and that workaround was approved, negating the need for delay. As of May 13, the directive for the Quiet Zone will be given to the engineers. As with any big change, there will be a period where they are learning to not sound the horns at the crossings. This should be EXPECTED. I personally plan to give them a couple of weeks to comply before alerting the railroad of non-compliance. How you decide to respond is, of course, up to you. Per information received from the city, the Winter Street Safety Zone has not yet been approved. As you may know, the Quiet Zone process cannot begin until the safety project is complete due to the complexities of the Safety Zone funding. Completion of the Safety Zone is expected in June. The Quiet Zone process will still take time after that, and under the best of circumstances, it will likely take 3 to 4 months for the paperwork and comment periods - giving us an expected completion timeframe of September-October 2010. Remember, don't shoot the messenger. We will continue to follow this situation and update as information comes in. RESULTS OF COMMENT PERIOD ARE IN. TO DISCUSS CONSTRUCTION, IMPROVEMENTS AND TIMELINE. We have received the results of the comment period from the city, and the residents around the tracks made their voices heard. Results were overwhelmingly in support of Quiet Zone implementation! So, an overwhelming 97% of respondents have given the city a mandate to make this Quiet Zone happen! With this news comes news of another meeting...this time an informational meeting, which will be held to talk about how the crossings will be upgraded, timelines and other information concerning Quiet Zone implementation. This is NOT another public comment period. The public input phase of this project is now complete, as the mandate from the community has made implementation a top priority. Background: The City of Houston is poised to begin construction necessary for the Washington Quiet Zone to be implemented. 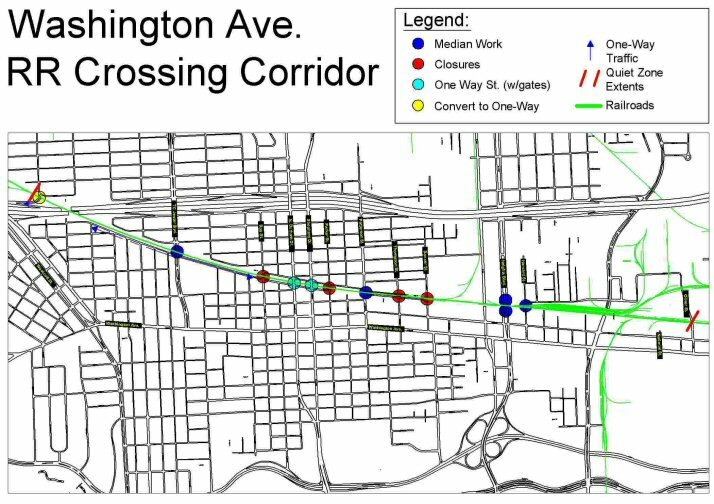 Hear a presentation regarding the crossing improvements as well as updated timelines, direct from the city. Portions of Allen Street will be converted to one way, leading away from Patterson, in the West End. The Quiet Zone in Cottage Grove north of I-10 will be temporarily delayed due to equipment issues at the Sherwin crossing. We have also received an update on the Safety Zone through the First Ward. 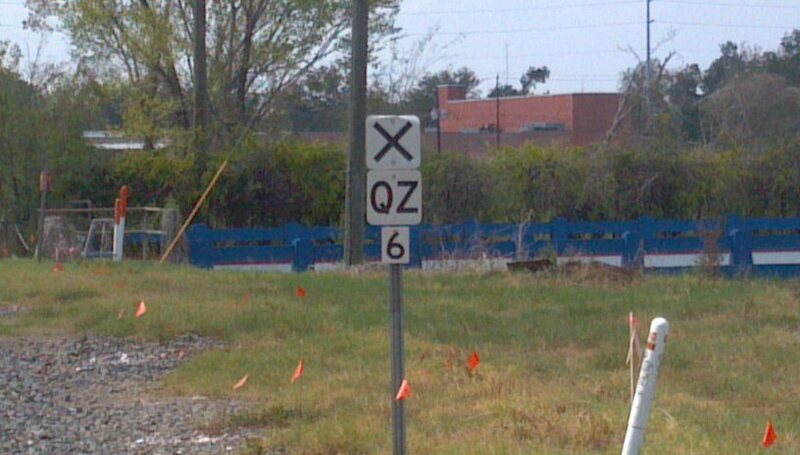 Construction continues at crossings that need upgrades to qualify for Safety Zone status. Once Safety Zone certification is reached, the application will be submitted to make the area a Quiet Zone. This will most likely take a lot less time to get done than the Sherwin - National Quiet Zone, and may even be implemented as a Quiet Zone before the rest of the area's improvements are complete. Moving forward! For more information on these and other Quiet Zone implementation issues, please attend Monday's meeting! THE WASHINGTON QUIET ZONE IS NOW CLOSED. by e-mail, please sign up for e-mail updates, using the above e-mail address. When we know, you'll know! Your neighbors thank you for your continued support! QUIET ZONE SUPPORTER INVOLVEMENT IMPERATIVE AT THIS CRUCIAL POINT! SO THAT WE CAN ACHIEVE MAXIMUM IMPACT! For those of you who have not visited the site since the last public meeting, please take a moment to read the August 27th update below, then return to this post to make sure your voices are heard! First off, make sure to fill our your name, address and phone with complete and CORRECT information. Then, click on "I DO support the proposed improvements." In the comments section we need to let the City know overwhelmingly that we would like the Quiet Zone to move forward as proposed, and as quickly as possible. [Optional] Our Quiet Zone initiative has been heralded by the City as one of the most civil and friendly in the City. In the comments, you may want to let them know how much you appreciate their continued hard work on this initiative. The City's survey/comment form can be found here. Get your friends and your neighbors to get involved and take just a couple of minutes to get this form filled out and sent in. The deadline is Monday, October 5, 2009 at 5:00 p.m.
At last night's Washington Quiet Zone public meeting, things became heated when several residents spoke out against the Quiet Zone. There was even talk at the meeting of the Quiet Zone beginning at Patterson instead of Oliver if the neighborhood wanted it that way, and there seemed to be several who were very vocal who did. If you live in the affected area between Patterson and Oliver, your voice needs to be heard loud and clear as to whether or not you want this Quiet Zone implemented. Read on to find out how to make an impact. Some attendees seemed to believe that if the neighborhood did not approve the Quiet Zone we would be able to take action on the parking and nuisance issues related to the retaurants and nightclubs along Washington. These are different and seperate issues which have no bearing on one another. See our Questions and Answers below from last night's meeting. The outcome of the meeting was that the Department of Public Works Traffic and Transportation Division do not feel they have neighborhood buy-in and have decided to open a SECOND public comment period. The public comment form will be posted on this site as soon as it is received. Let us be clear. This Quiet Zone may not go through if we do not have an overwhelming response. If you have neighbors with thoughts on this issue, get them to fill out a card and send it in to the City. Organize a time for your area to get cards out to those who may not know what is going on. At the meeting last night and in the last round of public comments, opponents' voices were heard. Will your voice be heard or will a vocal minority determine the outcome? The current closures have been in place for some time and will remain in place. After Union Pacific completes their work the City of Houston will issue a Notice of Intent and there will then be a 2 month comment period. The First Ward QUIET ZONE may actually be implemented sooner than the Washington Quiet Zone if other changes are not required by trhe FRA after the Safety Zone process is complete. Stay tuned for more on this. Parker and Roy are to remain open to vehicular traffic, due to neighborhood comments. Notice of Intent will be issued in January if not December. Thompson and Bonner crossings are recommended to be closed due to their proximity to Allen Street. There is no other way to make this work unless Allen Street is closed, which would deny access to property which fronts Allen Street, and that cannot happen. There are no plans to make Allen Street one way around TC Jester . Instead, the median at TC Jester south of the tracks will be extended to the railroad tracks, which will allow Allen Street to remain two-way. The WashingtonQuietZone.com Team would like to address some questions that were raised in the meeting from residents regarding the Quiet Zone. I oppose the Quiet Zone because of the money being spent. Why are we spending money on a Quiet Zone instead of [sidewalks/police/dog parks/parking/fixing the "bar problem"]? The City has allocated a certain amount of money to go to the Quiet Zone program city-wide. If these funds are not used for implementation of the Washington Quiet Zone, the money will go out of our neighborhood and to another potential Quiet Zone further down the list, not other issues inside our neighborhood. These other issues and efforts will not be funded with money marked for Quiet Zone use. However, there are several initiatives in the works for all of these other issues, which are also very important to residents. The WashingtonQuietZone.com team urges you to get involved with your neighborhood's Civic Club and Super Neighborhood #22 to do the work to organize, as we have, to make your voices heard. If you do not know which Civic Club your home falls under, please send us an e-mail at stoptrainhorns@washingtonquietzone.com and we will get you that information. This is the best way to stay informed about issues that affect your neighborhood. Will the Quiet Zone crossing closures affect the hoped-for future development along Yale, north of Washington, since the Bonner closure would cut off "back-door" access to the property? The only effect the crossing at Bonner should have on the development at Yale is to deter a neighborhood street from being used as a cut through to a large shopping destination. The crossing closure should reduce traffic in the neighborhood. Most traffic to any development in this location will be from the new, expanded feeder road and Yale exit from I-10 (due to begin work any day now according to TXDOT) and northbound on Yale from Washington Ave.
As we have seen with the Sawyer Heights development (Target, Petsmart, etc), even with more limited access than this (one way in and out) a development can and will thrive. Has anyone considered Police and Fire Service access for the community due to these crossing closures? Yes. The Police and Fire Departments had previously approved the closures of all four streets, including Parker and Roy. Now that Parker and Roy are not recommended to be closed, this makes the Quiet Zone implementation even further above Police and Fire needs. This is the first I am hearing of these closures. Why was I not informed? The City of Houston fulfilled its obligation to mail out notices to residences and businesses within a certain distance from the train tracks. If you did not receive a notification, then you are not within their notification area. However, area civic clubs and Super Neighborhood #22 meetings throughout the Washington Corridor have been highlighting this issue regularly at their meetings for many months. As mentioned before, please take time to be involved with your neighborhood civic club and the larger Super Neighborhood #22 Council. If you have any other questions you would like to see addressed here, or would like to be notified when there are further updates, please send an e-mail to stoptrainhorns@washingtonquietzone.com. This Quiet Zone has been well thought out and we appreciate the effort Public Works Traffic and Transportation Department has put into this. Please check back for the upcoming Public Works Comment Card which will be posted here. An overwhelming response is crucial, especially given last night's meeting. As always, your neighbors thank you for your continued support! The Washington Corridor Quiet Zone request is moving forward. A second public meeting will be held on Wednesday, August 26, 2009 at the West End Multi-Service Center located at 170 Heights Blvd, Houston, Texas 77007 from 7:00p-8:00p. This meeting is to provide the results of the comment period from the first public meeting and inform the neighborhood of the next steps concerning the Quiet Zone application in your area. We encourage you and your neighbors to attend this meeting and participate in this study process, as it may have a direct impact on your neighborhood streets. Your participation and input will help us better serve you and improve your neighborhood. So, as always, we are counting on your support to help fill the room to show that we are still 100% behind the Quiet Zone process. There will be people both for and against the Quiet Zone, so please make sure your voice is heard. This is one of the last hurdles before construction can begin! Let's all get together and push this over the top! Please send an e-mail to stoptrainhorns@washingtonquietzone.com if you are able to attend. An RSVP for this meeting is not necessary but we would like to know approximately how many supporters are planning to attend. Also, if you have any questions, please don't hesitate to ask us! Union Pacific will start their work on the line on August 10th. This will last about one month. Parker and Roy are to remain open to vehicular traffic. We are working on obtaining updated visuals and maps for posting on the site. This is the update we have received today. Council Member Gonzalez along with Public Works and Engineering will be holding another Town Hall Meeting in August to discuss these changes. I am sure there are many questions, so please send them to us at stoptrainhorns@washingtonquietzone.com and we will get them to the right people or answer them to the best of our knowledge. E-mail us if you would like to be on our distribution list for further updates as they happen. These are great steps in the process of getting the Washington Quiet Zone and the First Ward Safety Zone implemented! Special thanks to Council Member Ed Gonzalez and his staff whose help has been invaluable during this process so far. Action Items for Washington Quiet Zone Supporters! The City of Houston has set its official public meeting regarding implementation of the Washington Quiet Zone. This is one of the final steps in getting the Quiet Zone implemented! Background: The Quiet Zone program would like to hear your concerns regarding the proposed improvements. Public comments will be taken during the public meeting. It is imperative that we have an overwhelming show of support for the Quiet Zone from the neighborhood. We do know that there will be people on both sides of this issue in attendance at the meeting and we want to make sure our supporters' voices are heard loud and clear. The City has sent out a Public Meeting Notice to all residents within 250 feet of the railroad tracks, as required. We want to make sure that the overwhelming majority of comments received are in support of the Quiet Zone, so we can get it implemented and the train horns can finally be silenced! Print the Public Meeting Notice Comment Card and mail it to the City to show your support! Attend the Quiet Zone Public Meeting and make sure your voice is heard! 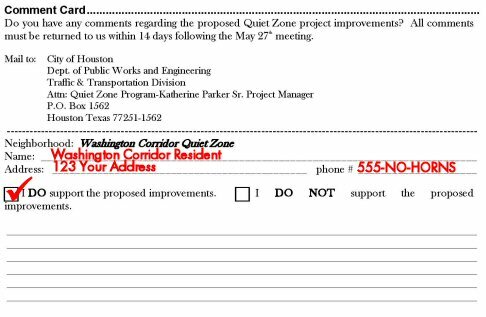 If you have any questions or concerns about how the Quiet Zone will affect you, or would like to receive e-mail status updates, please send them to me at stoptrainhorns@washingtonquietzone.com and I will get back to you with answers if I have them. In the meantime, get started filling out those comment cards and sending them in to the City! We are just steps away from realizing our goal! For those who live in the First Ward Safety Zone area, come show your support! This process will be upcoming for the First Ward after the safety zone is implemented. This will be a good chance show the City and other Washington Corridor residents that we support the Quiet Zone in its entirety, from downtown to Sherwin! I received an update from the City regarding the First Ward Safety Zone, and per Dale Hill, UPRR Manager of Public Industry Projects, the documents are at UPRR in Omaha awaiting signature for execution. I will let you know when I receive further updates or when news happens! Get those Comment Cards in the mail, and we will see you at the Public Meeting! Your neighbors thank you for your support! To the residents and businesses along the Washington corridor: Thank you for your overwhelming support. The town hall meeting was a success. In the meeting we learned about the terminology that the city is using, the differences between the Sherwin/National Quiet Zone and the Sawyer/Holly Safety Zone, potential crossings that would be closed, changes to traffic flow, and also learned more of the schedule for when the train horns will stop. The Sherwin/National Quiet Zone is currently on schedule to be implemented by the fall of 2009. The current proposed plan calls for crossing closures at Roy, Parker, Thompson and Bonner. Median work will take place at TC Jester and Heights in order to bring them into compliance for Quiet Zone status. The Sawyer/Holly Zone is separate from the Sherwin/National Zone, in that the former is a Safety Zone, and the latter is a Quiet Zone. The next step in the process is for a Public Meeting to be held, so that comments from the community can be heard before the Sherwin/National Quiet Zone work begins. This meeting is tentatively schedule for mid to late May. We will send updates as appropriate. Another large turnout is necessary! There are many blanks in the above information that will be filled by the City's materials, but we have been receiving questions regarding the meeting and wanted to get this interim update out to you. We will send out e-mails to our list when the update is completed so you will have the full picture. In the meantime, we'll continue to work with the city to make sure this process continues to move forward! Who: CITY OF HOUSTON PUBLIC WORKS & ENGINEERING DEPT. Ray Chong / Katherine Parker as well as other City and neighborhood officials...and YOU! Background: A “Town Hall” Meeting has finally been arranged for all the local residents and the City of Houston Public Works & Engineering Dept., who will be handling the actual implementation of the Washington Quiet Zone. This meeting is to explain the Quiet Zone process and to take questions from the community. Bring your questions, your friends, and your neighbors. The Quiet Zone/Safety Zone Town Hall Meeting is going full speed ahead! We need a HUGE TURNOUT from the community to make sure the City knows that the community is behind this effort! This is our chance to have our questions answered and make our voices heard! For those of you who want to help get the word out about the meeting, we have posted a flyer for you to print and disseminate to your neighbors. Remember, your involvement can make difference as to whether or not these Zones are implemented, so we need your help! You'll be hearing information on the First Ward Safety Zone and the Washington Quiet Zone that has not yet been disseminated, including proposed road closings, crossing reconfigurations and timelines for when those train horns will stop, with the answers coming straight from the officials in charge. While an RSVP is not required to attend the meeting, we are trying to get an informal head count in order to gauge attendance. PLEASE RSVP to stoptrainhorns@washingtonquietzone.com to let us know you will be there to support this effort! Has Achieved Tier I Status! Quiet Zone Work to Begin by June 2009. January 27, 2009 - Supporters of the Washington Quiet Zone gathered in the City Council Chambers to voice their support for the Washington Quiet Zone effort. During the meeting, speakers were called to the lobby for an announcement. The city manager's office let us know that the new rankings for Quiet Zone implementation had been released earlier in the day, partially in response to the speakers' presence on the City Council's agenda. The Washington Quiet Zone will be implemented from National to Sherwin. The map at the link below (PDF format) from the City of Houston shows all Quiet Zones and their rankings. The Zones denoted by letters are Zones that are funded by developers or other funding sources, and the zones labeled 1 through 6 are the zones that received Fiscal Year 2009 priority. This is an exciting milestone for our effort. However, your support is still needed to ensure this process continues. The City Council will not officially vote on this measure for another few weeks. We will keep you updated as more information becomes available. The WashingtonQuietZone.com team would like to extend a sincere thank you to Mayor White and the entire City Council for their support thus far, and their commitment to making the Washington Avenue Corridor a world-class area. A special thank you goes out to all supporters of the effort. Your involvement, letters, e-mails and phone calls are what is making this possible. UPDATE: The Washington Quiet Zone Effort was featured on Channel 11 at 6:00. Thanks to those who made this happen! Tired of Waking Up to Train Horns at Night? and an Improved Quality of Life? Support the Washington Quiet Zone Effort! 1. E-MAIL, WRITE, OR CALL Mayor Bill White, expressing your interest in the establishment of a Quiet Zone along the Washington Corridor, copying Houston City Councilman Adrian Garcia, Houston city Councilwoman Pam Holm, and Public Works and Engineering Traffic and Transportation Senior Project Manager, Katherine Parker (contact info below). 2. Subscribe to our email distribution (e-mail stoptrainhorns@washingtonquietzone.com) to receive further news and updates, and find out how you can help. 3. Spread the word to other neighborhood residents by telling them to visit WashingtonQuietZone.com! UPDATED INFORMATION! Washington Quiet Zone - ACTION DAY - Tomorrow, January 27! The meeting will begin promptly at 1:30 p.m., NOT 2:00 as previously disseminated. Please make note, and try to arrive early, by 1:20 so we can be sure to enter the room on time! can find a spot for $.25 per hour!! in advance for those who plan to attend. We still need more people to join us. This is YOUR CHANCE to MAKE YOUR VOICES HEARD! Please e-mail actionday@washingtonquietzone.com if you are able to attend. in support of our effort, or has other ideas to garner attention, please let us know! UPDATE - 1/26/2009 Now is the time for action! Your help is urgently needed! On Tuesday, January 27, 2009 at 1:30 p.m. representatives of the community will be speaking in front of the City Council at City Hall. We need your help to PACK THE ROOM with supporters. We need approximately 200 people to attend and support our speakers. Will you give a late lunch hour for your community? Please e-mail actionday@washingtonquietzone.com and let us know that you will be attending! This is our chance and we need everyone's help! Also, any ideas that you have to get attention, whether through signs, media contacts, city bloggers who may be friends, please let us know that as well when you send us your attendance! Thank you in advance for your support and please send those ideas along! UPDATE - 12/22/2008 Thank you for the overwhelming response, and keep those letters and e-mails coming. We are making an impact, but we need more help to drive our point home. Please send your friends to this site to sign up and let the City know we want these train horns silenced! As of today, we have employees of some of the premier organizations in the city represented, all losing sleep and keeping the entire City from realizing its potential. This is just a sample of the companies represented in our movement. They all care enough to show their support, so let's ask the City to care enough about these companies and their employees to stop these train horns! Thank you so much for your continued efforts and support! UPDATE - 11/28/2008: The organizers behind Super Neighborhood 22, StopTrainHorns, and WashingtonQuietZone have combined efforts to raise our collective voice against disruptive train horns in our community! o The City of Houston's Public Works and Engineering Department has the Quiet Zone proposal and is currently in the process of collecting traffic and accident data from all the proposed areas. o A 'calculator' will be used to determine the score of each, and the areas will be ranked accordingly. Certain criteria such as density will be taken into consideration during the ranking, and the calculations should be done by next month. o Public Works will prepare a fact sheet, which may be ready as early as NEXT WEEK to distribute to the public regarding their respective areas. o However, the entire quiet zone process could take more than a year. o "We have TxDot and Union Pacific funds sitting there that can be used to make the safety zone happen and I hate to see the project get bogged down somewhere in the bureaucracy of the city." o Western General commissioned a report from Railroad Controls Limited, which found the noise level was greater than 120 decibels! Gibson responded, “Because the streets are unprotected, the train is required to blow its horn throughout the entire area almost continuously. The train noise is significant. Given the proximity of the homes to the track, the noise itself is actually a safety issue for the residents." "When you're working with the rail lines in the auspices of what we're talking about - eliminating the interaction of trains and vehicles - I tend to believe we are achieving safety and a by-product of that is some quietness." o The PWE is working to have the prioritized list by the end of November. o The more the community can come together to show its support of this initiative, the greater the chance we have of rising in the prioritization rankings. o Since our effort began, the Washington Corridor has risen in the rankings from Tier III to Tier II. We CAN pressure the city of Houston and Mayor Bill White to give this project TOP priority by having “as many area residents and businesses as possible BOMBARD Mayor White’s email account or mail with this specific request/complaint” (per Councilman Adrian Garcia). A Quiet Zone is a railroad grade crossing at which trains are prohibited from sounding their horns in order to decrease the noise level for nearby residential communities. The train horns can be silenced only when other safety measures compensate for the absence of the horns. The Federal Railroad Administration (FRA) train horn rule provides localities nationwide with the opportunity to establish Quiet Zones. The federal rule pre-empts all applicable state laws. To qualify, communities wishing to establish Quiet Zones must equip proposed grade crossings with adequate safety measures to overcome the decrease in safety created by silencing the train horns. The additional safety measures must be constructed at the community’s own expense and must meet federal specifications. The federal rule also contains language which for the first time restricts the volume of train horns. In response to a legislative mandate, FRA has issued a Final Rule on the Use of Locomotive Horns at Highway-Rail Grade Crossings. This final rule, which requires that locomotive horns be sounded as a warning to highway users at public highway-rail crossings, took effect on June 24, 2005. The final rule provides an opportunity, not available before, for thousands of localities nationwide to mitigate the effects of train horn noise by establishing new Quiet Zones. What is the Status of the Washington Quiet Zone? The Washington Corridor is currently under consideration for implementation of a Quiet Zone. In fact, the City of Houston's Public Works Department has created a plan to implement the Quiet Zone. Funds have been allocated for fiscal years 2008 through 2013 to implement these Quiet Zones. The opportunity for our neighborhood lies in the fact that there are 13 other areas of Houston that are also seeking Quiet Zone designation, and financial resources for implementation of Quiet Zone plans are limited. The City of Houston is in the process of prioritizing the 14 potential Quiet Zones and a list will be announced in the coming weeks. We want to be first on the list! As with many City Government issues, traditionally the "squeaky wheel gets the grease," and the more residents of the area we can get to call, e-mail and mail in their support for the Quiet Zone, the higher we may be placed on the list of priority Zones. If we, as a neighborhood, will voice our support of the initiative, we can look forward to realizing the Washington corridor's true potential and raising our quality of life. TO BE INCLUDED IN FUTURE COMMUNICATIONS OR TO BECOME MORE INVOLVED IN THIS EFFORT, PLEASE EMAIL stoptrainhorns@washingtonquietzone.com. Send an e-mail to Jack.Hanagriff@houstontx.gov with all details, especially date and time.